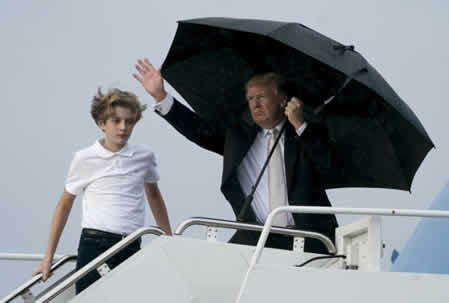 Pictures of the President getting on board Air Force One in Florida show him holding the umbrella above himself to stop him from getting wet. 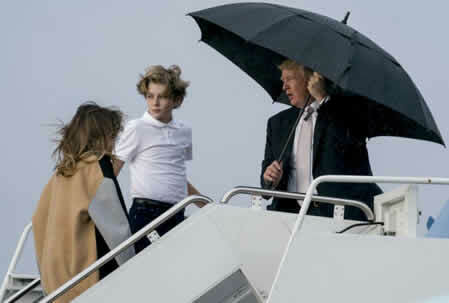 Unfortunately, Trump didn’t bother letting wife, Melania, and son, Barron, underneath as well, leaving them exposed to the elements. The trio were on their way back to Washington from Trump’s Mar-A-Lago club, after spending the weekend there. While at the club, Trump addressed recent accusations that he had described Haiti as a “sh*thole” at an Oval Office meeting. The White House has not denied that Trump said ‘sh*thole’, while Republican Senator David Perdue told ABC’s This Week: “I am telling you that he did not use that word. “And I’m telling you it’s a gross misrepresentation.